Yet again I had to admit my negative judgement wasn’t just premature, but inappropriate too. After assessing bikes for not far short of a couple of decades now, you’d think I should know better. Being patient and seeing the whole picture is so important in this testing game, and is certainly the message I took away from my experience with this RG500. Maybe it was the stiflingly hot weather, maybe I was just expecting way too much from the Suzuki. Whatever, it took time for impressions to become fully favourable. Owner Richard Adams had turned up on his gleaming example, eager to learn what I thought of it. At that point, things looked pretty positive. The RG is still a very stylish bit of kit, and a lap ogling it on foot got my heart going a bit. The pretty, all-encompassing bodywork reflects a design clearly well ahead of its day. It might be over a quarter of a century old now, but I reckon with just a few styling tweaks here and there, you could bring the 500 bang up-to-date. With modern suspension and wheels, you could almost pass it off as new. With more of a sit up and beg riding position than I’d expected, and a seat low enough to get my stubby limbs on the deck, all seemed set for an easy affair. Then I tried to start it. Chuckles greeted my search for a non-existent starter button. And when I tried to boot over the square four motor in gear with the clutch in, only to deliver a lifeless swing due to no direct link between kickstarter and crankshaft, the laughter was only interrupted by the question: Are you sure you’re qualified to test this thing?” It seemed like a justifiable enquiry, I have to admit. Once back in neutral, the action of my right foot proved effective, and endearing sounds and smells from the four pipes promptly filled the summer evening air. What an utterly fantastic racket and odour. To be honest, I could have just sat there revving the Suzuki, letting my ears and nostrils savour those wonderfully sharp sensations. You just don’t get opportunities to sample big two-strokes like the RG anymore. With the tallish first gear snicked into place again I pootled off. There’s decent drive from fairly low rpm thanks to the ‘Automatic Exhaust Control’ system that effectively alters the volume of the pipes to boost power. The white-faced tacho may only start its rpm detection at 3000, suggesting a typically peaky output; the reality is more friendly. Screaming the motor and slipping its clutch to leave the line is not at all necessary. However, that was the last compliment I paid the bike for quite some time. As we’d decided to take pictures of the RG before the sunlight faded, I went to turn round to get back to the corner we’d chosen. Trouble was, in an effort to slow the bike down I quickly discovered the brakes were… well, abysmal really. I would have been better off opening my jacket and putting my feet down. Give ’em a chance I thought, get some heat into the pads and they’ll improve. If they did, I didn’t notice. Though maybe it’s because my thoughts were then diverted by something else worrying — the tyres. Man, they felt like they were made of mahogany, giving the impression they’d instantly have me off if I tipped the 500 over just a degree or two from vertical. I didn’t feel at all comfortable, and with Richard stood keenly watching me piloting his pride and joy, visions of him exploding with rage as he witnessed his precious steed sliding down the road proved too disturbing. I pulled in and explained my dilemma. He was disappointed that I was disappointed. Things got better when I just went for a normal ride. Rounding the same corner repeatedly for photos can often ask a lot from a bike, the more flowing nature of the journey once the camera has been put away often shows things in a better light. And so it was with the RG. Just a few miles is all it took to feel more positive. 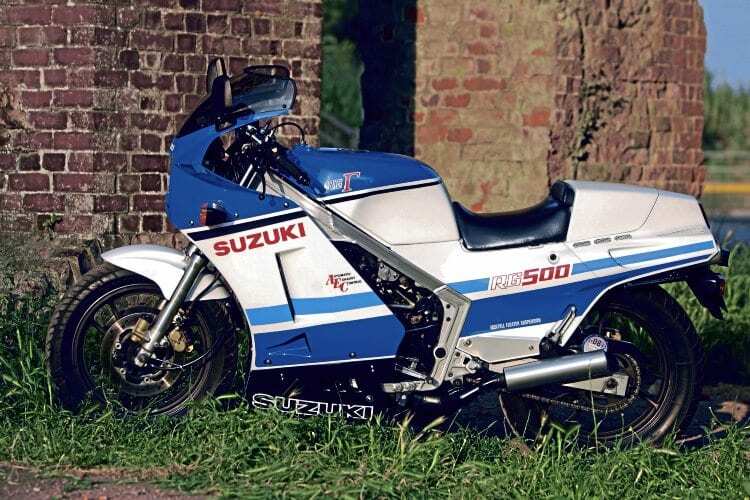 Sure the tyres and brakes still needed looking at, something emphasised by Richard admitting he doesn’t ride the Suzuki that often. Storing bikes is like storing food to me, and slowly but surely things start to go off. Servicing the brakes, and fitting some new rubber would no doubt improve the performance of both, and make the Suzuki nicer to ride. It was a shame that I couldn’t sample more of it. Even so, I still got to feel the distinct and thrilling pick up in power when the twin cranks were spun harder. 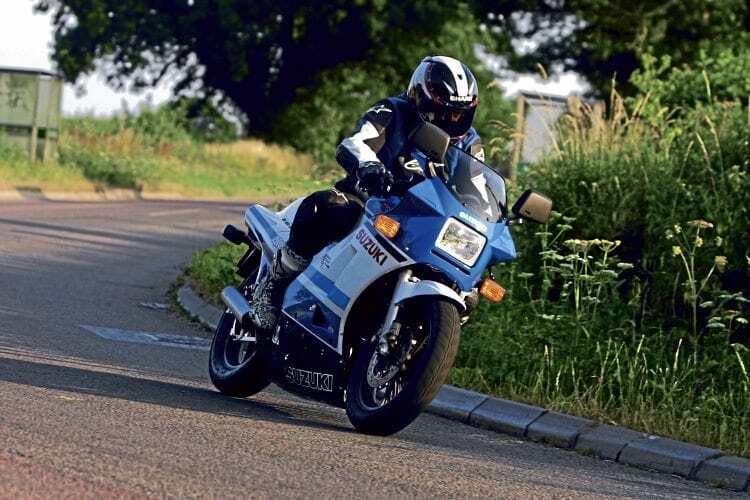 And though the thrust isn’t too strong by modern standards, like all strokers, when it got on the pipe a bit more it soon started to sing and thrill. 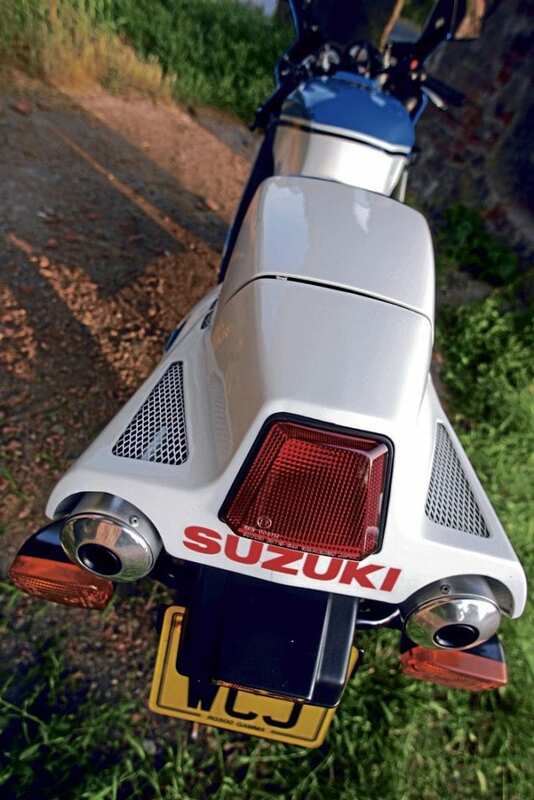 A unique shape from any angle; the RG500 still seduces. Hence the price tag. As it did, other things started to gel. The light weight of the 500 makes steering it quite easy, and though it has a 16in front wheel, its lazy 30° head angle helps to keep things more stable. Suspension action felt okay too. All in all I was having a better time, and then I started to appreciate another key dimension of the bike — its reputation. I realised I’d not been judging the bike to the full. 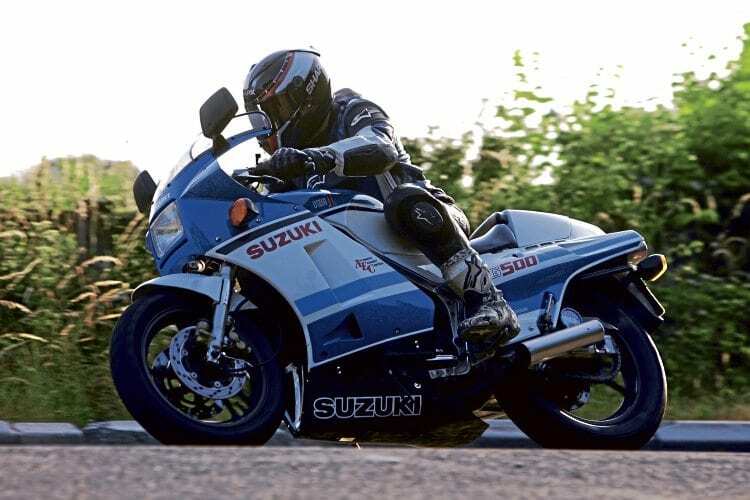 It didn’t matter that the Suzuki had felt under par dynamically. Just like it’s done to Madonna, the passage of time has taken the edge off it a bit. 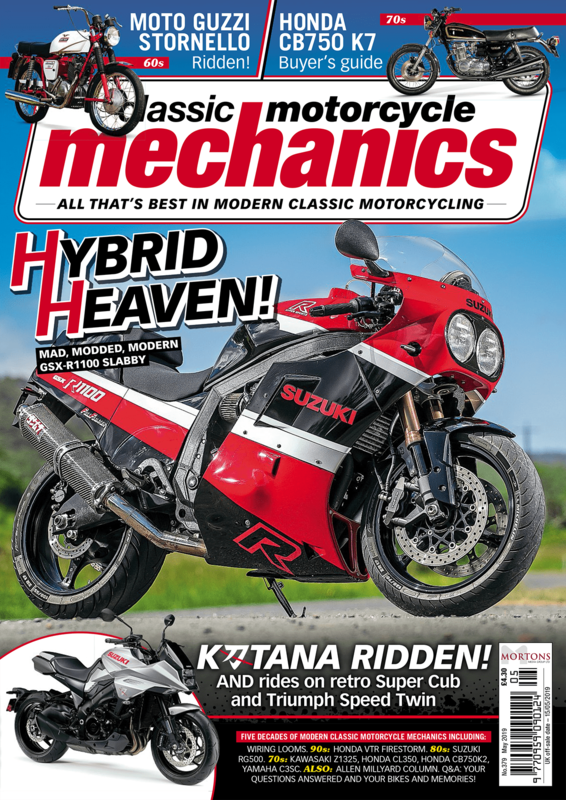 While for many, the RG is a symbol of a classic world gone crazy, there’s no denying the allure of the big two-stroke. “If you really want to improve your RG’s braking and grip, then you’ll have to modify the bike and fit better kit. 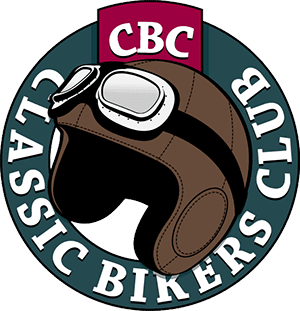 With standard equipment they just can’t match today’s bikes,” says Mark Grey of RG500 specialist, Performance Fabrications. Enhancing the Suzukis has been his trade from 1998 and there’s not much he doesn’t know about the bike. “There’s still a lot of them out there. Loads were sold originally and now the bike has become a collector’s item owners are really cherishing them. Good, standard ones bring around £8000 these days, even if sellers are asking way more than that. Many of my customers spend money on engine tuning and boring out carbs. But some are spending a hell of a lot fitting RG motors to different chassis like the Suzuki RGV250 and GSX-R400, Aprilia RS250, and Yamaha R6. I’m just fitting one into a Spondon chassis now.